Think kid-friendly, don't rush and enjoy the process of a homegrown experience! Long before Fast Food Nation became a way of life for many families come meal time, there was the family garden. It was a place where mothers, fathers and children were stewards of the land in spring and fall, where they nurtured seedlings into vegetables, growing them, preparing them and eating them. Tending to a family garden has roots in both the need for food and the need for care. If you're like most parents with young children, you've probably got a finicky eater in the midst. Refresh his palette with the taste of homegrown goodness. "I’ve never seen a child refuse to eat something she grew herself,” says Amanda Grant, author of Grow It, Cook It With Kids (Ryland Peters & Small; 2010). Get books at the library. Get some for your children, too. Look at websites together, talk to friends about starting a garden. Pick a sunny spot in your yard where you can make it happen. Do this as a family. Decide what you want to grow — easy foods include carrots, radishes, lettuce, green beans, cherry tomatoes, green onions and snow peas. Sketch a rough drawing of your garden. Go to nurseries, Home Depot, look at seeds and starter plants together — get inspired! Rent a tiller from a gardening center for your garden and till the land — this job is for Mom or Dad, but it will be exciting for the kids to watch their backyard transform. Let the kids pick up small rocks, weeds and such as the tilling continues. Rake and smooth the soil. Give your child a small section that is HIS for the caring. A 5’ by 5’ space is fine. Once the soil is well tilled and loose, and the grass clumps are removed, improve the soil with organic matter like compost before you begin to plant. Turn the compost into your soil to a depth of six to eight inches with garden forks. Once this is done, cover all of the organic layer with three inches of soil. With Mom and Dad leading the way, start planting and refer to the sketch you made for “what goes where.” Let the kids get good and dirty. For tomatoes, you might want to use transplants rather than seeds just to speed things up. Give everything a good watering once it’s in the ground. • Kids are more likely to eat what they have grown. • It’s excellent physical activity. 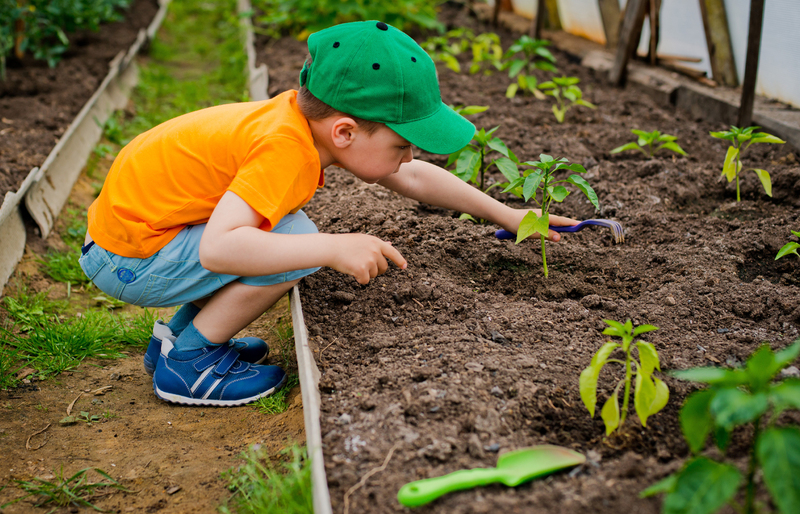 • Kids who grow up with a garden are more likely to have one later in life. • Gardening can be a needed downtime for busy children and adults. • The garden is a place of learning — cooking, science, new vocabulary, etc. • It helps you connect with nature. • Gardening together can help deepen family connections. • A garden can help set better eating habits for life. • It can save you money and deter you from hopping in the car to eat out. • Excess harvest can be donated to those in need. • You’ll be able to enjoy some of the freshest and healthiest food. Want to start a garden but don't have the space at your home? Here's a handy solution. Stoney Creek Farm (4700 Coe Lane, Franklin) rents garden plots in three different sizes: 10' x 10' ($75); 10' x 20' ($100); and 20' x 30' ($125). The rental is for one season, and it also comes with a Gardening 101 class and mentoring. Once you obtain the space, the rest is up to you. Trips to the farm to care for your family's garden plot can be fun family outings — especially at harvest time! For more info, contact Stoney Creek at 615-591-0015 or visit the farm's website. Your family can also participate in community garden projects through The Nashville Food Project. The project currently provides space for more than 70 community gardeners to grow their own vegetables, while providing a functional outdoor classroom. To get learn more, or to get involved, click HERE.